Always unplug the refrigerator before you work on it. Review safety procedures. The most common problem in a refrigerator that is leaking is a plugged drain. 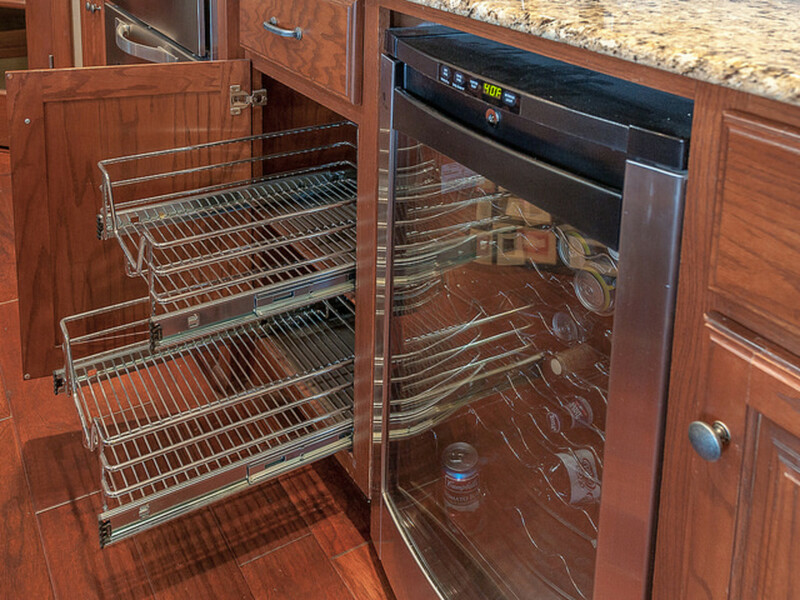 All frost free refrigerators have a defrost cycle that melts the frost and ice that may build up on the evaporator coils and the water is channeled off to a pan or tray located outside of the refrigerator, usually underneath the refrigerator near the compressor. The drain can be plugged with bits of food, ice, or plastic bag closers. In some refrigerators this drain is easily located and can be cleaned resulting in normal operation. However, most refrigerators have this drain located behind a back panel and will require some disassembly to access the drain. This process takes some patience and time. Make a note about where the water is coming from. Is it coming out of the freezer compartment, is it coming out of the fresh food compartment, is it coming from under the refrigerator, is it leaking from the back. How often does it leak? Twice a day or more? 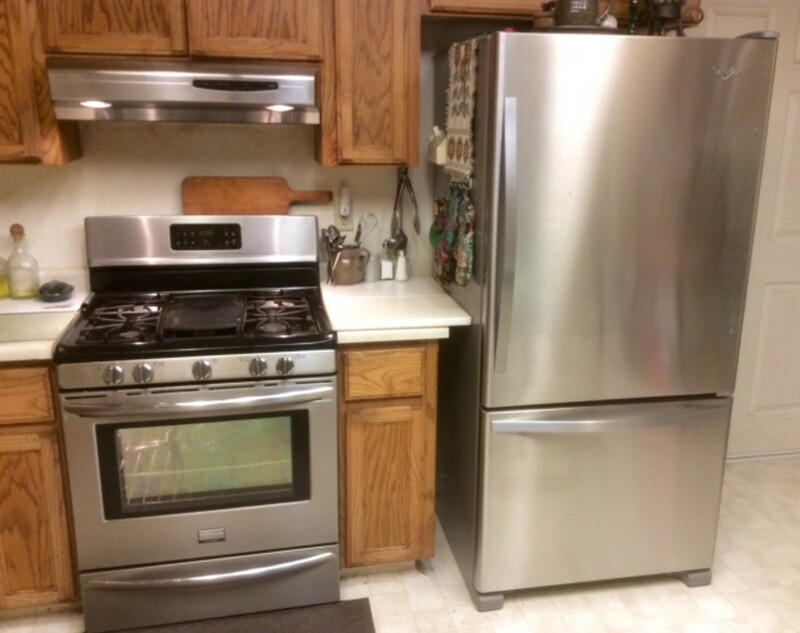 If your refrigerator/freezer is a side by side model, then the leak would generally be coming from the freezer section and it would make some ice on the floor of the freezer until any depression was filled and then it would leak out the front of the freezer compartment onto the floor about 2 or 3 times a day. Depending on conditions, you could expect to see around 1 to 1 1/2 cups of water on the floor. In dryer conditions, the amount could be less. 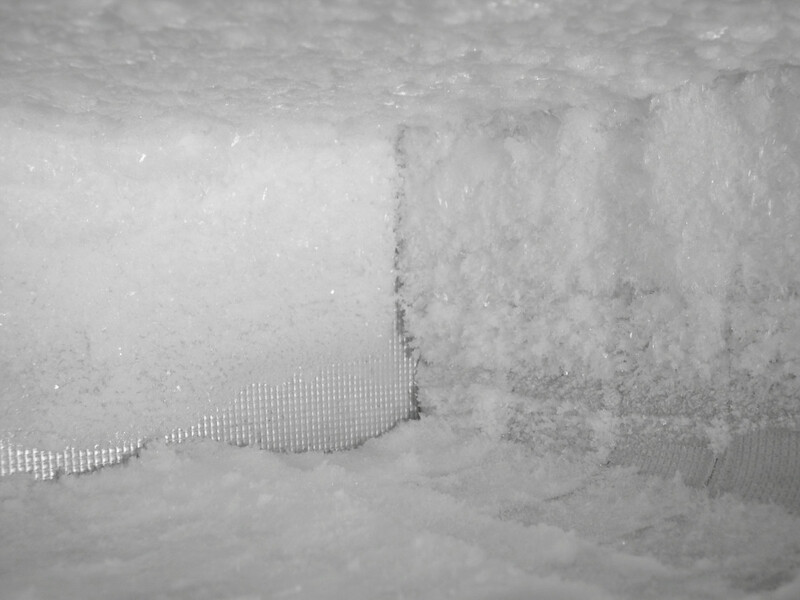 Defrosting can be achieved by leaving the freezer door open and waiting several hours. Place a couple of large towels on the floor of the freezer to catch the water. Change the towels as they collect water. Ice that can be removed by picking it up may be removed. Do not pry, poke, cut, or otherwise try to mechanically remove the ice, doing so may cause damage or injury. The tube that goes through the back of the refrigerator may come from the back of the fresh food compartment where it has a small tray about 2 inches square that catches water dripping from the freezer compartment. This small tray is removable and generally can be taken out by pulling on it. You will see than that it is plugged and needs to be cleaned and opened up. 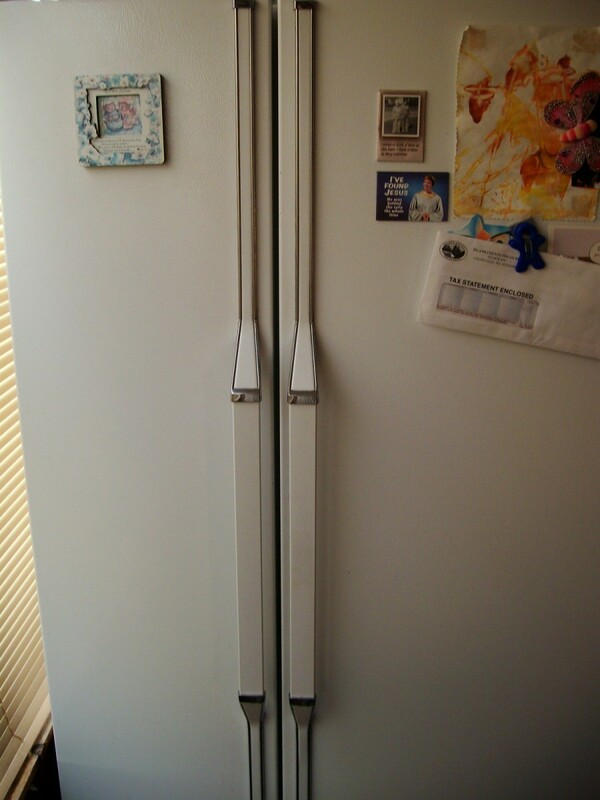 You may have to remove a cover from the back of the refrigerator which is normally a plastic decorative cover. Other components could be located under the cover, so caution should be used in removing it. Water is brought to the refrigerator through a connector on the back. It is connected to a water valve normally located on the bottom of the back of the refrigerator near the bottom. Turn the water off to the ice maker and see if that cures the problem, if it does, then the leak is somewhere in the ice maker set up. If you just moved the refrigerator to a new location, the move may have misaligned the hose that comes down or the pan itself. Check to see that all portions of the drain and pan are fitting properly and that the drain tube is not misaligned. How Does My Refrigerator Work? I had a leak at the bottom rear of the fridge and noticed the fresh water pump was corroded and cracked. I changed the pump and all was well. While I did move the appliance, the drip pan was in place. I moved the appliance again a week later (installing new tile). When I connected the fresh water line to the fridge I noticed water squirting out of the top rear feed when it began drawing water to the ice maker section. I checked the seal which appeared OK and thought it was just a minor refill issue. The next morning I had a puddle and soaked towel on the floor. I did notice frozen water icicles in the freezer just below the ice maker. Any guess if hard water could create this problem, too? I am about to defrost. Thanks. I have the same issues as Marilyn, from 4 months ago. Can you help? Thanks. 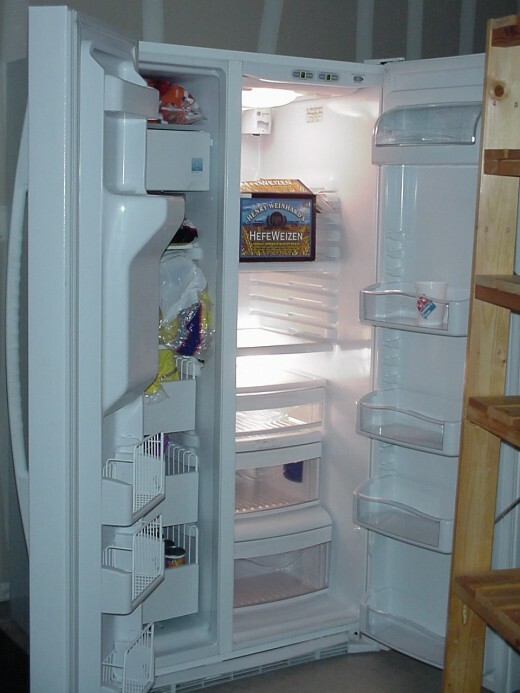 We just bought a top freezer refrigerator (Frigidaire) last month. This week, our power went out for 3 days due to the hurricane. When we got our power back on, we noticed our fridge is leaking water on the floor in the front and back part of the fridge. Does anyone know what could be the problem and how to fix it? Have a Roper refrigerator and ice cube tray fills up half way then discharges rest of water down discharge tube. Replaced water inlet valve but still discharging extra water and not filling tray. Help! I have a Whirlpool side by side. I did have tubing replaced to water dispenser but still leaks underneath. I did try to defrost drain on bottom from front. Too actually move the refrigerator out from its opening is almost impossible. Any other suggestions to defrost opening? It doesn't leak everyday. About a cup every othet day. I also have not put in a new water filter yet. Would that cause it to leak? Good stuff - thank you so much. Now, to the task at hand! Problem-water noted on adjacent wall in another room. Called plumber who emphatically stated plumbing is not to blame. It's the French door refrigerator with freezer on the bottom. Technician came and said its plumbing issue. Moisture is not always present, so I shut off ice maker and did not use water dispenser after confirming the adjacent area was dry. 12 hours later it's wet again, my thought is the drip pan may be cracked/damaged and when system defrosts the water seaps out. Are you still responding to requests for help? My Kenmore fridge, freezer on bottom, recently started leaking from the left side bottom of freezer. We removed the back panel and saw that the hose that runs from the compressor to the fridge (maybe what carries the coolant?) was frosted over. when the ice melts, it makes a puddle under the fridge. It has even corroded the edge of the fridge! It's only 2 years old, but needed a new compressor after only 1 year of purchase. 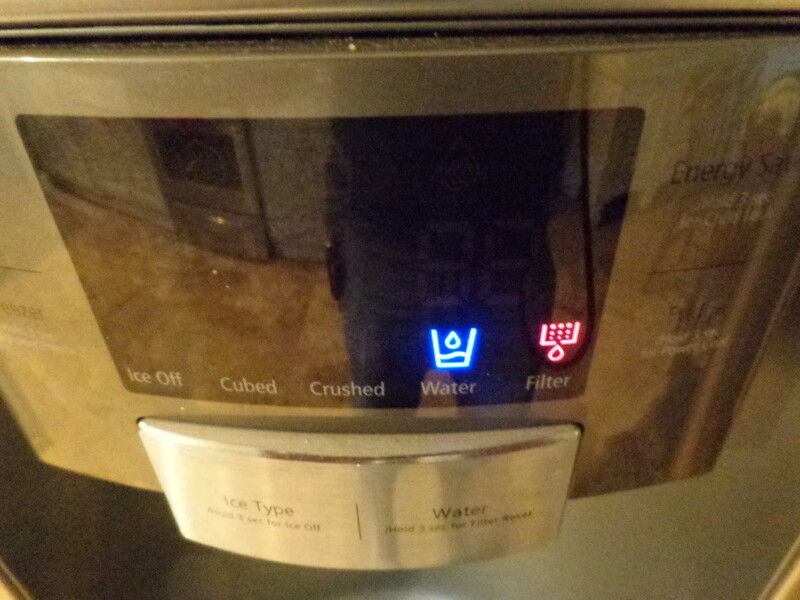 I notice that the higher I se the temp (which is recommended temp by manufacturer) the more water it leaks. I had a client (I'm a realtor) that turned the water off when they left the house to go out of town. When they returned water had leaked from the refrigerator door water dispenser. Does it make sense that the change in water pressure could cause that? My refrigerator has a small leak inside in the back center. We have shut off the water supply to the ice maker thinking that that was the problem but it still leaks about 1/2 cup of water a day. And it seems to only leak at night. Help! I have a GE Profile side by side with an ice / water despenser in the door. Water is leaking from under the ice despenser panel and runs down the door. Where is this coming from? I have searched the internet and have not found a solution. I had a repair man look at it and he took the panel off and caulked around it to create a seal. ( like that would really solve the problem) Any ideas would be greatly appreciated. I have a bottom mount fridge, no ice maker... Kenmore brand.. I have to dump water out of the right crisper drawer every week and there is usually a yellow line going down the back of the drawer... Everything else seems fine... Any ideas??? I had a GE Profile side-by-side. The ice maker stopped making ice, and I should have known. We had a guy from sears come out, who told us it was most likely the pump, but he wasn't sure, and we would need to order a $350 part to tell. We didn't pay for that visit. What he didn't notice was the puddle on the floor behind the refrigerator (would have helped if he had pulled it out) that eventually rotted the floor out. There are two plastic water lines coming from an electronically-controlled valve switch in the back on the bottom. Right next to it is a sticker that warns you *not* to use plastic water lines to the wall because they may age and leak. These two lines run right next to the condenser, which gets very warm. By the time I found the issue, the plastic tubes were basically disintegrated next to the condenser, and every time it would cycle to refill the ice maker, it would pour a cup of water on the floor. Ended up replacing the subfloor, hardwood, everything. Never GE again, and never Sears again. Good stuff. Found the leak and saw water dripping right before my eyes. But I'm allergic fix-em-up projects. Called Sears. Paid $200 for repairs. I have a side by side with freezer on left. The right door has a drip coming out from the bottom of the door from the little hole on the bottom of door. This does not seem to be connected at all to the freezer so where is the leak coming from? I have had a leaking problem for over 2 years. I would take everything out, open both doors and let it sit unplugged for hours and after a day or two it would start leaking again. Last night I read something somewhere to turn the temperature down in both the freezer and refrig.,so I did that this morning and left for the day. That tube that everyone is talking about most of defrosted and of course there was water from the defrosting, but after I dried everything off, no more dripping. It has been a couple of years dripping and now no more dripping. I am so excited. Turn the temp down and have dry fresh mushrooms and excellent dry Wisconsin cheese when you open your refrig. I can't find the original suggestion and who wrote it, but you are a genious.Thanks. 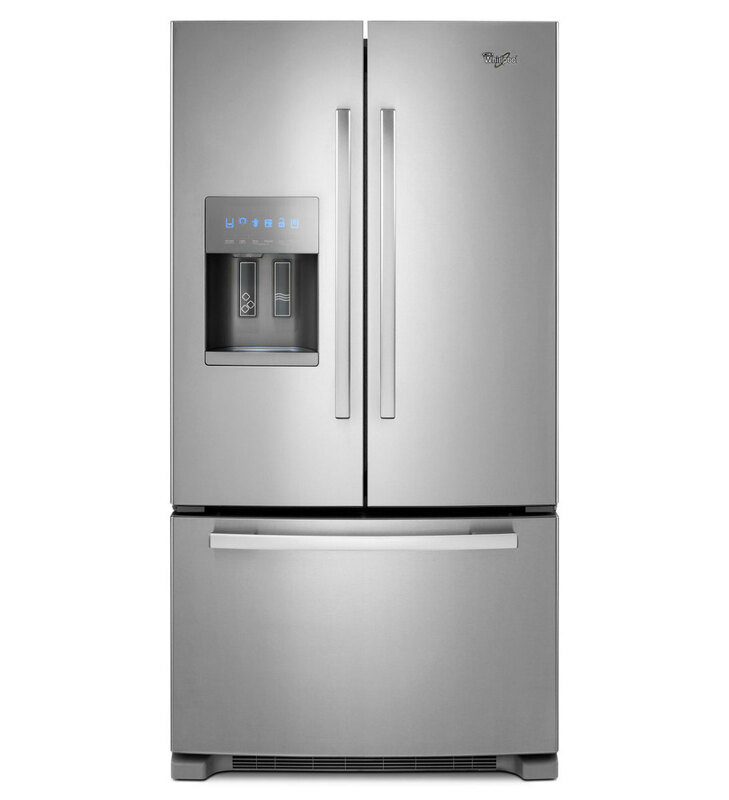 French Door refrigerators have dual refrigerator doors and a pullout freezer drawer for convenient fresh and frozen food storage. My GE Profile side-by-side is also leaking water from the rear right. I pulled it out and removed the lower grill. After emptying the collection tray, I noticed that water drips from the black unit (condenser?) when the water dispenser is used. I also noticed that after a repairman had come out to fix the electrical connection for the ice/water dispenser, there suddenly was a delay of about 2 seconds every time the water dispenser was pressed. Does that suggest anything I might be able to repair myself? Do I need to remove the large back panel? Thanks for your great help. Thanks! An excellent place of resources. My refrig(GE profile performace) recently had problem of leaking water. It was from the ice dispenser. I can see the thin water trace frim outside of the door. It seems that the water is dripping down from the water hose in the ice dispenser. Any idea how to fixed? how can I disassemble the door so I can look inside the dispenser? Thanks! An excellent article. Very useful and simple to follow. So many people assume the worst when they develop problems with their refrigerator, but the majority of fixes are actually very simple. Thanks. @whitton Glad to see it might be helpful. I hope it works. Thanks for stopping by. Nice Hub and very useful information. 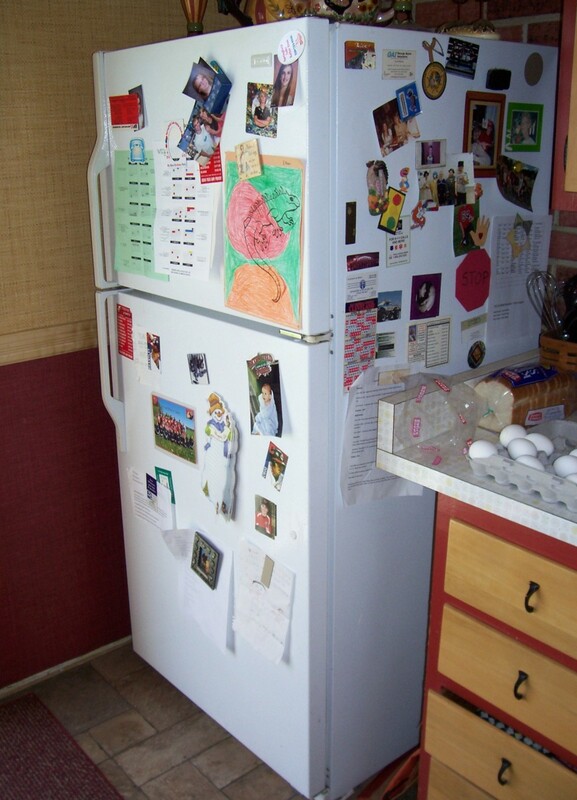 My friend's fridge has been acting up and leaking and now I can suggest these areas that you have mentioned. Thanks for the help!! @tonymac04 I hope this helps, that's why I wrote it. Thanks for reading and commenting. Thanks for this info. It might just help me with the problem I have with our fridge. You may have a very simple problem, there is a tube that goes through the back of the fridge to bring water through the back wall, it may not be in the correct position or the water supply line on the back of it may be loose. It sounds like you are not getting any leak when the ice maker is off. There is a connection to the water valve that leads up the fridge, that may be loose, tighten the conncections and you might be good to go. The other possibility is that the water supply line from the water valve to the top of the fridge has a leak, replace it for about $10. Also, easy to do. I identified that the leak (a small puddle about 1/8 cup) occurs under the fridge whenever the icemaker is making ice. My workaround is just to use the old fashion ice maker trays. It will be a while before I get to removing all the food so I can move the fridge and access the back or underneath. I have a broken finger preventing me to do many things. Ugh! Thanks for your article. It is so much better than all the refrigerator repair articles on the 'Net. Rich Glad you finally were able to fix the problem. Too bad about the floor, at least it won't get worse. Good luck and thanks for reading. Brent You may be hearing the defrost cycle. Is the sound continuous or intermittent? If it is intermittent and you hear it only sometimes, you are probably hearing the defrost cycle. The refrigerator turns on a heater a couple times a day, the coils defrost and the water hitting the heaters makes a sizzling sound. This takes about 15 to 20 minutes each time. If it is continuous, you may be hearing the defrost timer. If there is no water, then it is likely that you are hearing the mechanical timer which may sound like a hissing maybe more like a rapid ticking. 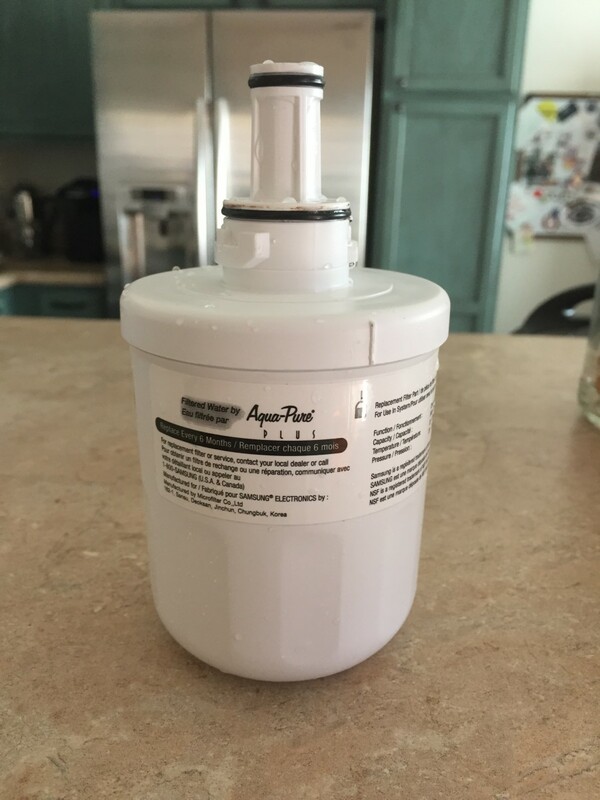 If by chance, the sound is water, you can eliminate the problem by turning the water to the ice maker dispenser off. Check in a couple of hours to see if you hear the sound. If your have water inside the refrigerator, you may have a leak in the water dispenser. Awsome, this fixed it. Too bad I didn't do this 2 years ago when the "mysterious" puddles had been forming. Now I have a rotted floor to fix. Fortunatly I fixed my side-by-side Fridg. I think that I may have the same problem. I have a hissing sound (small pressure water leak) and dripping sound, coming from the lower rear of my fridge. I've looked and can not see water running, pooling, or otherwise. Moving the fridge out to get behind it, the water connection came loose and it did start to leak visible water. I tightened that, stopped the leak, still the hissing and dripping sounds though. My water dispenser works, haven't verified that the ice maker does though. any insight? Johnny Joe thanks for the kind words. Glad you found it informative, I plan to have some video in the future that may help people take a more daring course of events. I hope that helps. Wow. A great job done. You have explained everything regarding the refrigerator leaking issues. I thought of removing the back panel when I had this issue. However, I did not dare to do that and contacted support. Thanks Risto, appreciate the read and comment. You must have a heat pump, yes the most likely cause is a plugged drain. Should be a simple fix. Thanks for coming by and leaving a comment. I have this problem with my furnance when the air conditioner is running. I will check for a blocked drain. Thanks for being willing to share your expertise. Adam9001 I hope this has helped understanding what causes this annoying problem. I appreciate you reading my hub. Thanks. Thanks for the great informtion.